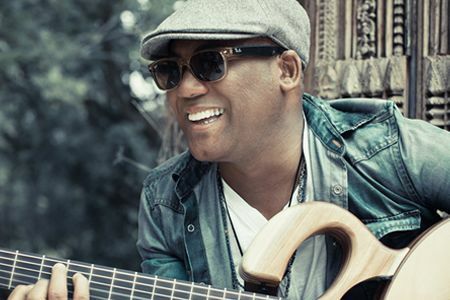 Legendary singer, Jonathan Butler grew up the youngest of 13 children in Cape Town, South Africa, ruled by Apartheid and segregation. He began his singing career at age 7, releasing his first album in 1973 and winning the Best New Artist GRAMMY in South Africa the following year at age 12. He made history as the first black artist played on white South African radio, earning three Gold Records while still a teenager. Since then, Butler has become and international sensation, earning more Gold Albums in the UK and the US. He received GRAMMY nominations for Best R&B Song for his hit, “Lies” and for Best Jazz Song for the instrumental, “Going Home.” Butler’s genre-busting material earned songwriter’s awards and received abundant airplay in multiple radio formats: pop, urban, contemporary jazz, adult contemporary and gospel. His album, Surrender, went Gold in South Africa where he remains a superstar. In concert, Butler remains a captivating and powerful performer, pouring his heart into selections from his immense catalogue.